Northern Colorado Friends of Ferals is now a member of Colorado Gives and will be participating in Colorado Gives Day On December 8, 2015. NCFF will receive a portion of the Colordo Give $1 million dollar fund for every donation we receive through ColoradoGives. Stay tuned for updates on how to donate. Animal Assistance Foundation November 2013 $10,000 to purchase a transport van. As of July 20,2016, NCFF has trapped, altered and vaccinated 6297 cats, found homes for 760 kittens and strays. We could do much more with a few more committed volunteers. Why not be part of the solution? You love cats or you would not be reading this. An ounce of prevention is worth a pound of cure. Spaying a female cat prevents the death in our shelters of thousands of cats. The 2013 Fundraiser netted NCFF $3807 in donations. Thank you donors! On September 12, after a busy summer of TNR clinics for Northern Colorado Friends of Ferals, the rains began, leading to the worst Colorado flooding in 500 years. As the flood reports continued throughout the weekend we became concerned about the cats in the two trailer parks in Evans where we had trapped, neutered and returned earlier in the summer. Bella Vista MHP and Eastwood MHP were both washed out when the South Platte River overflowed its banks. Trailers were overturned and most were under 2-5 feet of water and muck. The sewage plant was destroyed and contaminated water mixed with floodwater to make a smelly and hazardous mess…one we will not soon forget. Three of our group visited the Weld Humane Society shelter to see what help they needed. Staff and animals had been forced to evacuate moments before the flood. We were told that there were cats in trees and in trailers that were surrounded by water. Only dogs and people were being rescued from the areas. We were appalled by this news and did not hesitate to grab traps, tall boots and bottled water, and head for the trailer parks. We arrived minutes before everyone was shut out except for FEMA, the National Guard and us, Northern Colorado Friends of Ferals. We did not ask permission to “wade” in. When it comes to rescuing animals in need, we have learned that it is far easier to get forgiveness than permission. After all was said and done we discovered that we were the only animal rescue folks there. 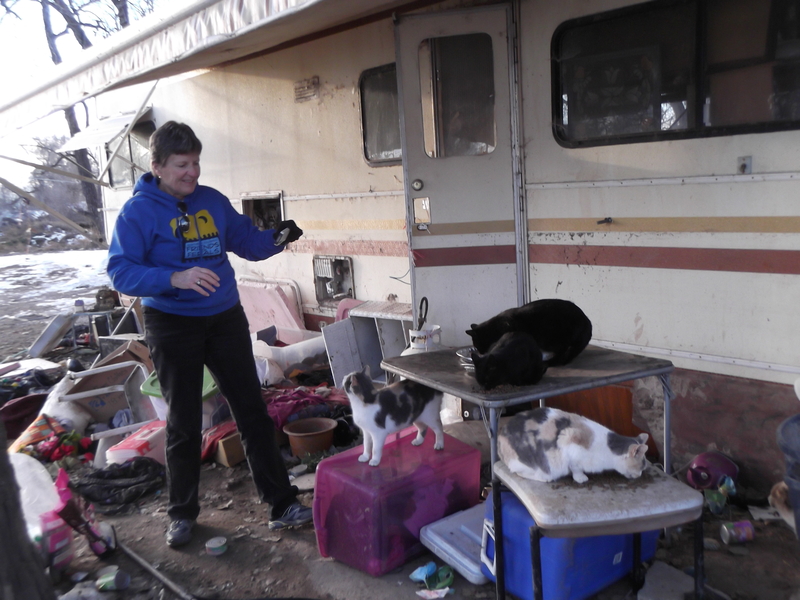 By looking for paw prints in the mud, checking for old cat food cans and with the help of displaced residents searching through demolished trailers for photos and cherished items, we were able to find and trap 57 cats. In subsequent weeks we were able to find a few more survivors. Many were ear-tipped and about half were tame cats. The first day we trapped we saw an orange cat peeking out one of the trailer windows. After FEMA broke the front door, he took off running. Four days of trapping did not get Chester in our hands. Weeks later we got a call from Weld Humane. Because he was ear-tipped they called us to pick him up, or they would “euthanize” him. Chester turned out to be a very friendly and loving survivor who, after escaping death was taken into foster care. The last cat to go into our traps was a large gray tabby with what looked like a terrible neck wound. It turned out he was tame and FIV positive so it took a long time for him to heal. During that time he wangled his way into the heart of his foster mom and was adopted as “Herman.” Not many cats were claimed by displaced residents, and many were sick with URI’s and intestinal infections from living in filth and not having had clean water and food for days. We were very grateful when Alley Cat Allies contacted us just days after the flood and sent much needed money for medical care, food and supplies. Thankfully, by collaborating with local no-kill shelters, we were able to find adoptive homes for tame cats and barn homes for feral cats. So, September turned out to be far more rewarding than expected. October was equally challenging. 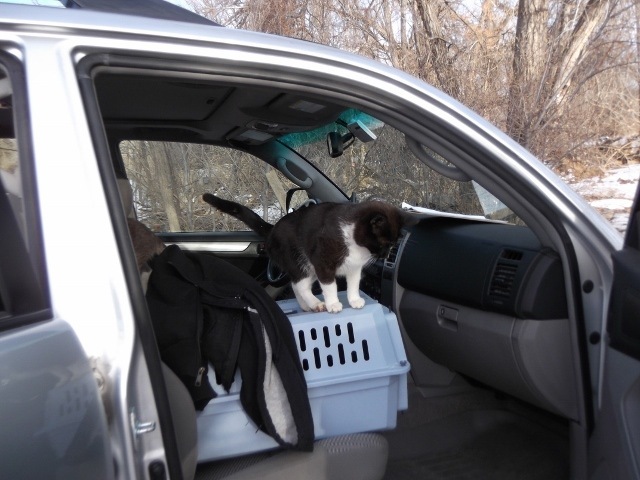 Our semi-annual community/tame cat mash unit clinic helped 144 cats from Evans and Greeley. They were all fixed and vaccinated in one day. In this group we had 19 kittens, many of which had panleukopenia and required round the clock nursing from our fosters. In addition on our November 17th clinic we trapped and altered another 61 cats, including 16 kittens. Kitten season seems to be endless this year. 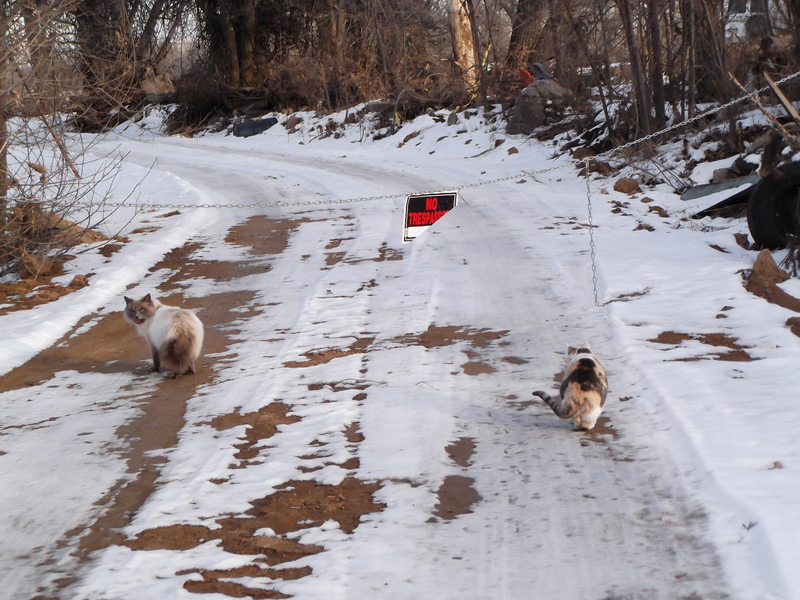 We continue to find colonies with great numbers of cats that need food and medical care. It is heartbreaking to see them eating spaghetti, or worse yet, eating out of dumpsters. LOOK FOR A NEW SERIES ON ANIMAL PLANET AIRING LATE FALL/EARLY WINTER FEATURING OUR APRIL 12, 2015 CLINIC AT STERLING!!!!!!!! !